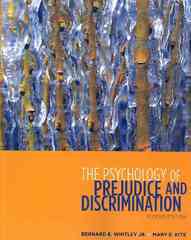 The Psychology of Prejudice and Discrimination 2 Edition This is the first comprehensive textbook on prejudice with a strong psychological research base. Whitley and Kite cover a broad range of topics--from race and ethnicity to gender, sexual orientation, and ageism. By integrating theory and research with students' own experiences, the authors increase students' awareness of influences that shape prejudices. As students evaluate research results and their personal, subjective beliefs, they develop an appreciation of scientific evidence regarding stereotypes, prejudice, and discrimination.